What a clever and well-researched book! That it’s about food and directed at educating children (and adults I’d say) about healthy eating and preparation, makes it more exciting. This ‘edible adventure’ is full of fun, brilliant ideas, lots of food facts, origins of food items and healthy ideas. It also challenges children to try everything, even when it looks different. 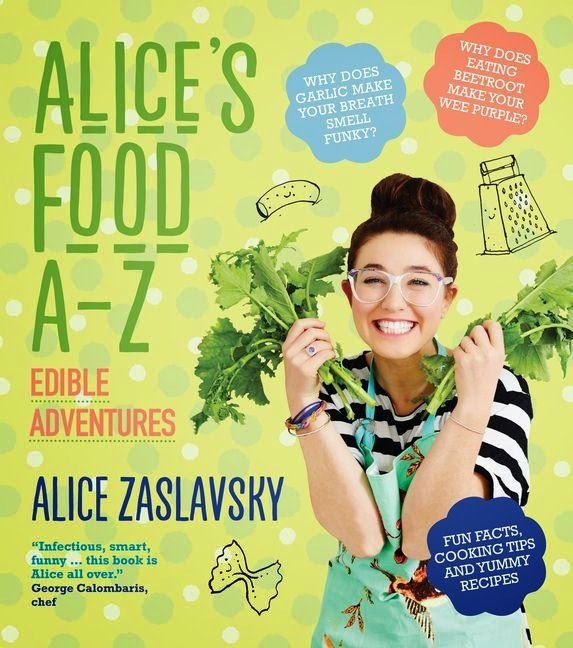 Alice Zaslavsky is no newcomer to food. She has an expansive list of accomplishments to boast about which includes her competing in MasterChef Australia Series 4. She also hosts Kitchen Whiz, a ‘food knowledge quiz show for kids’ aged 8 and over on Channel Nine’s Go! Alice plays with words as well as food. She expresses herself like a tour guide full of professional knowledge, but through the world of food and its history. She prepares you for a great experience. And each page is just that! The entire content is ecologically and environmentally aware, therefore encourages people to be conscious consumers, and ask questions about where their food comes from. There is so much here to appreciate and attempt. Most of the food indexed is natural and healthy, and is accompanied by ideas and tips for its preparation. There are Fun Facts about each food item presented. Word Wizard gives the definition of words that children might not know. What’s in a Name tells the origin of each food name, and the list goes on. There are over 40 recipes for children to try. Always aware of safety issues, it is made clear when there is a ‘grown-up supervision alert’. One of my favourite bits of information is ‘key numbers’ in the honey section. It presents amazing trivia via numbers about bees: life span, how much honey a bee produces in its lifetime, average distance it flies per hour- that sort of thing.